The brainstem is the stalklike portion of the brain that joins higher brain centers to the spinal cord. It contains several nuclei that are surrounded by white matter. Ascending (sensory) and descending (motor) axons between higher brain centers and the spinal cord pass through the brainstem. 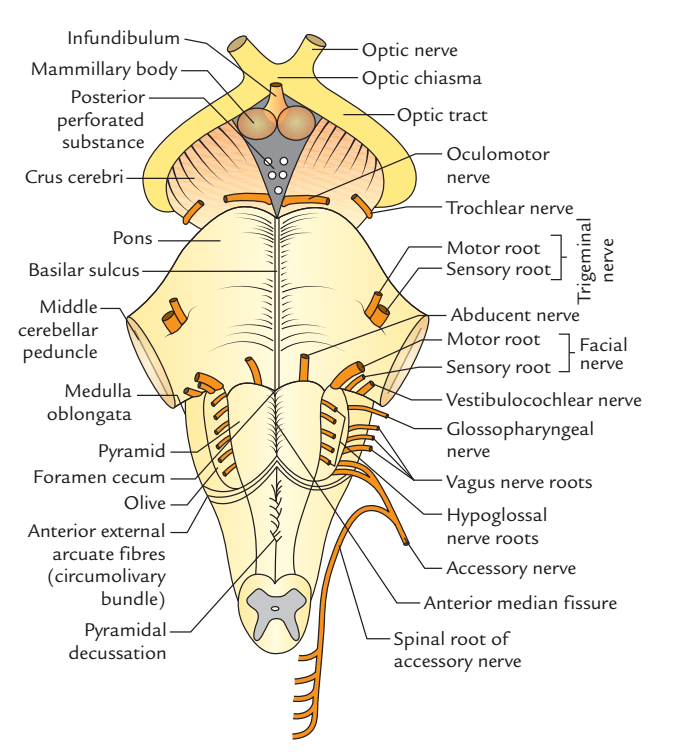 The components of the brainstem include the midbrain, pons, and medulla oblongata. The stalklike part of the brain which connects the forebrain (diencephalon and cerebrum) with the spinal cord is called the brainstem. From below upward, it consists of the medulla oblongata, pons and midbrain. It is composed of nerve fibres and nerve cells. The nerve cells like spinal cord don’t create one central mass of grey matter; instead majority of them are aggregated to create well defined nuclei. 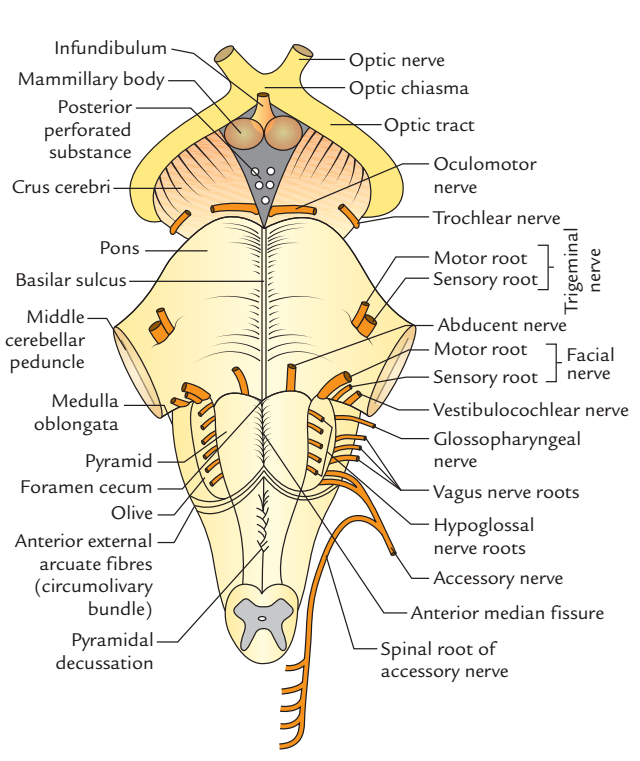 Majority of the fibres in the brainstem are arranged longitudinally in the creation of tracts as in the spinal cord. Nuclei of last 10 cranial nerves (i.e., 3rd-12th cranial nerves). The brainstem includes the diffuse system of cells and fibres named reticular formation along with well-defined tracts and nuclei. A number of the cells of reticular formation create essential centers, viz. cardiac, respiratory, vasomotor etc. They’re of Great Physiological Relevance, in spite of the fact that these centers aren’t anatomically demonstrable. The midbrain is the most superior portion of the brainstem. It is located posterior to the hypothalamus and superior to the pons. It contains reflex centers for head, eye, and body movements in response to visual and auditory stimuli. For example, reflexively turning the head to enable better vision or better hearing is activated by the midbrain. The pons lies between the midbrain and the medulla oblongata and is recognizable by its bulblike anterior portion. It consists primarily of axons. Longitudinal axons connect lower and higher brain centers, and transverse axons connect with the cerebellum. The pons also works with the medulla oblongata by controlling the rate and depth of breathing. The respiratory rhythmicity center controls the basic rhythm of breathing by triggering each cycle of inhale and exhale. It is also involved in associated reflexes such as coughing and sneezing. The cardiac control center regulates the rate and force of heart contractions. The vasomotor center regulates blood pressure and blood flow by controlling the diameter of blood vessels.